A new study suggests low blood levels of vitamin B12 markers in older adults may be associated with lower brain volumes and problems with cognition. Researchers at Rush University Medical Center say that foods from animals, including fish, meat, especially liver, milk, eggs and poultry are usual sources of vitamin B12. Investigators took blood samples from 121 older residents of the South Side of Chicago who are a part of the Chicago Health and Aging Project (CHAP) — a large study of 10,000 biracial subjects over the age of 65. The results of the study are published in Neurology, the medical journal of the American Academy of Neurology. The participants had blood drawn to measure levels of vitamin B12 and B12-related markers that can indicate a B12 deficiency. The same subjects took tests measuring their memory and other cognitive skills. After about 4 1/2 years, MRI scans of the participants’ brains were taken to measure total brain volume and look for other signs of brain damage. Researchers determined vitamin B12 deficiency was associated with having lower scores on the cognitive tests and smaller total brain volume. “Our findings definitely deserve further examination,” said Christine C. Tangney, Ph.D., associate professor in the department of clinical nutrition at Rush University Medical Center, and lead author of the study. Tangney noted that the level of vitamin B12 itself in the blood was not associated with cognitive problems or loss in brain volume. She said that low vitamin B12 can be difficult to detect in older people when looking only at blood levels of the vitamin. “Our findings lend support for the contention that poor vitamin B12 status is a potential risk factor for brain atrophy and may contribute to cognitive impairment,” said Tangney. In a unique study, researchers at The Long Island Brain Tumor Center at Neurological Surgery, P.C. are examining whether hyperbaric oxygen therapy – breathing pure oxygen while in a pressurized chamber – may prove a useful addition to the current standard of care for patients newly diagnosed with glioblastoma, an aggressive brain cancer. The Phase II study is currently enrolling participants, and is being conducted at Neurological Surgery, P.C. offices in Nassau and Suffolk Counties, New York, as well as at Winthrop University Hospital, Mineola, NY. According to the National Cancer Institute, malignant brain tumors are the second leading cause of cancer deaths in people under 35, and the fourth leading cause of cancer death in people under 54. Glioblastoma is the most common and most aggressive primary (non-metastatic) type of brain cancer. Median survival for glioblastomas is 12-14 months, and only 26 percent of patients survive two years. Drs. Duic and Grewal are also interested in evaluating the effect of this treatment on patients’ quality of life and stress levels. Participants will be asked to complete several brief questionnaires. In the current study, which is the only one of its type underway in the U.S., patients will first receive blood and medical imaging tests. They will then be given six weeks of hyperbaric treatments combined with radiation (Monday-Friday) and chemotherapy with temozolomide, which they will take at home daily. They will then have four weeks off treatment, then resume taking temozolomide on a monthly basis. Study participants will receive the experimental hyperbaric therapy prior to each radiation treatment during the initial six weeks of treatment. 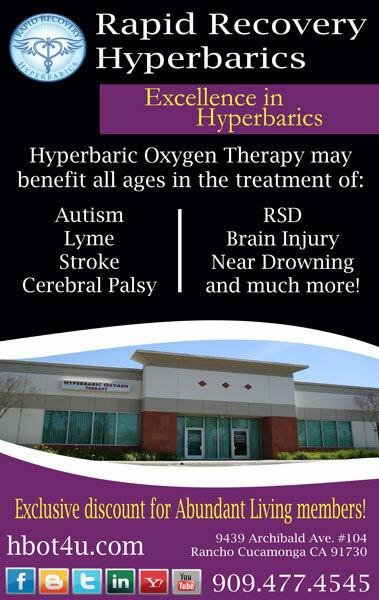 During the hyperbaric treatment, the patient will lie on a stretcher in a hyperbaric chamber and breathe oxygen at greater than normal atmospheric pressure. Blood sugar measurements will be taken, and medical imaging tests will also be done. Patient participation in the study lasts one year, unless the patient cannot tolerate further treatment or side effects, or shows evidence of tumor progression. Patients may also voluntarily withdraw from the study. Neurological Surgery, P.C. is one of the New York City area’s premier neurosurgical groups, offering patients the most advanced treatments of brain and spine disorders. These include minimally invasive procedures such as stereotactic radiosurgery (Gamma Knife® and CyberKnife®), aneurysm coiling, neuro-endoscopy, spinal stimulators, carotid stents, interventional pain management, microdiscectomy, kyphoplasty, and X-STOP®. The practice’s physicians represent a range of surgical and nonsurgical specialties, combining compassionate care with highly specialized training. They are leaders in the region’s medical community, with appointments as chiefs of neurosurgery in some of Long Island’s best hospitals. NSPC offers eight convenient locations in Queens, Nassau and Suffolk Counties. For more information, call 1-800-775-7784 or visit http://www.NSPC.com. Look for us in local church direcetories! 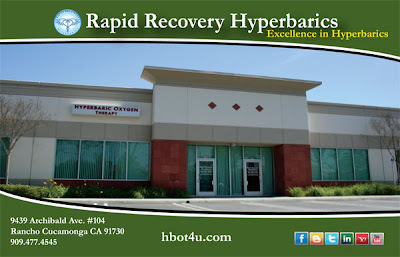 Rapid Recovery Hyperbarics is now published in the church business directories for Water of Life Community Church (Fontana, www.wateroflifecc.org) as well as Abundant Living Family Church (Rancho Cucamonga, www.abundantfamily.org)! Also Check us out in these church's online directories! Announcing our Fall coupon offer for new clients! 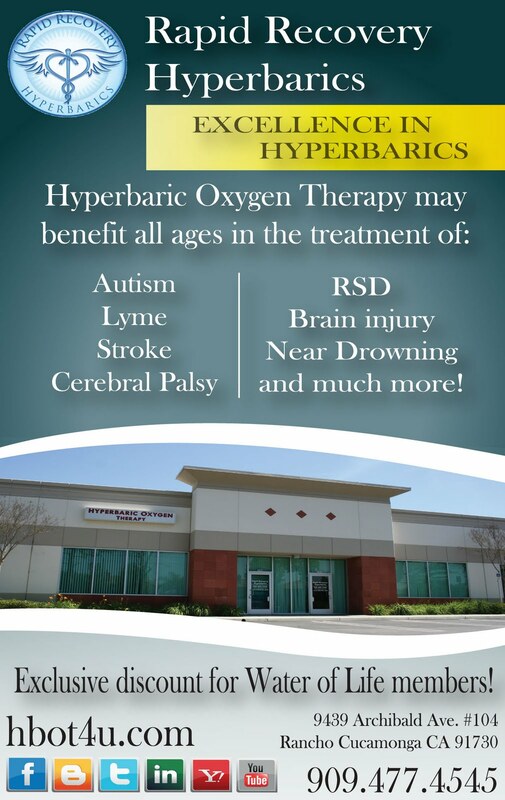 For the last 13years+ Rapid Recovery Hyperbarics has been treating many conditions with amazing results! Lyme Disease, Autism, Stroke, RSD, CP, Near drowning, Closed head injuries and much more! 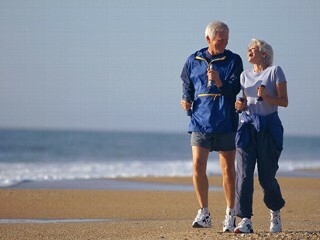 New York, NY, August 15, 2011 – Regular exercise could help prevent brain damage associated with neurodegenerative diseases like Alzheimer's, according to research published this month in Elsevier's journal Brain, Behavior, and Immunity. "Exercise allows the brain to rapidly produce chemicals that prevent damaging inflammation", said Professor Jean Harry, who led the study at the National Institute of Environmental Health Sciences in the United States. "This could help us develop a therapeutic approach for early intervention in preventing damage to the brain." 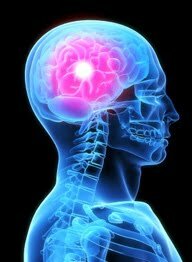 Previous research has already demonstrated that exercise after brain injury can help the repair mechanisms. This new study shows that exercise before the onset of damage modifies the brain environment in such a way that the neurons are protected from severe insults. The study used an experimental model of brain damage, in which mice are exposed to a chemical that destroys the hippocampus, an area of the brain which controls learning and memory. Mice that were exercised regularly prior to exposure produced an immune messenger called interleukin-6 in the brain, which dampens the harmful inflammatory response to this damage, and prevents the loss of function that is usually observed. Pharmacological therapies to downregulate inflammation and address cognitive decline in older adults, and those with Alzheimer's disease, have been less successful. This research helps understand how exercise could be used to affect the path of many human conditions, such as neurodevelopmental disorders and neurodegenerative diseases. In addition, as a chemical model of neuronal damage was used, it also raises the possibility that exercise could offer protection against the potentially harmful effects of environmental toxins. "This elegant series of experiments reveals an alternative pathway by which voluntary physical exercise may protect hippocampal neurons", said Dr. Ruth Barrientos from the Department of Psychology and Neuroscience at the University of Colorado. "The study on the role of exercise as a therapeutic intervention will undoubtedly get a workout in the years to come. Perhaps the greatest challenge with this line of research will not be more discoveries of compelling evidence of the anti-neuroinflammatory effects of exercise, but instead, getting humans to exercise voluntarily and regularly." The research was funded by the Division of Intramural Research, National Institute of Environmental Health Sciences, and the National Institutes of Health. The article is "Voluntary exercise protects hippocampal neurons from trimethyltin injury: Possible role of interleukin-6 to modulate tumor necrosis factor receptor-mediated neurotoxicity" by Jason A. Funk, Julia Gohlke, Andrew D. Kraft, Christopher A. McPherson and Jennifer B. Collins. The article appears in Brain, Behavior, and Immunity, Volume 25, Number 6 (August 2011), published by Elsevier. Brain, Behavior, and Immunity, founded in 1987, is the official journal of the Psychoneuroimmunology Research Society (PNIRS). This innovative journal publishes peer-reviewed basic, experimental, and clinical studies dealing with behavioral, neural, endocrine, and immune system interactions in humans and animals. It is an international, interdisciplinary journal devoted to investigation of the physiological systems that integrate behavioral and immunological responses. The journal welcomes original research in neuroscience, immunology, integrative physiology, behavioral biology, psychiatry, psychology, and clinical medicine and is inclusive of research at the molecular, cellular, social, and organismic levels. The journal features online submission and review, leading to timely publication of experimental results. There are no submission fees or page charges for Brain, Behavior, and Immunity, which is published eight times a year. 3. Increases in blood flow independent of new blood vessel formation. 7. Increased production of new mitochondria from HBOT. the CNS: Studies have shown that HBOT increases the production of stem cells in the bone marrow and that transfer of stem cells to the central nervous system is possible. 13. Direct production of stem cells by certain areas in the brain. 15. The possibility that oxidation may help rid the body of petrochemicals. 16. The possibility that oxidation may help rid the body of mercury and heavy metals. 17. Increases patients own Stem Cells to heal the brain. Do you know someone with Lyme, CP, Autism, Near Drowning, RSD, Closed Head Injury or another condition? Share the amazing power of Hyperbaric Oxygen Therapy with them! and call us at 909.477.4545 for your FREE information package! 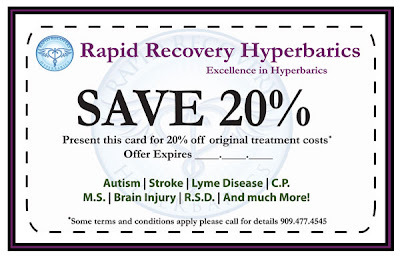 And dont forget to connect with us on facebook, Twitter, Youtube and Yahoo groups for special offers, exclusive discounts, news and insights from Rapid Recovery!